Stereo has brought an added dimension of space and depth to the record scene - space and depth to the furniture for it too. The Pye Stereophonic Projection System is a revolutionary quality stereo record reproducer in its very size. There are no separate speakers. From a mere twenty two inches of width the sound fills your living room evenly and faithful to the original performance. What creates the stereo sound in this compact unit? Normal living room walls are very good reflection surfaces for sound. 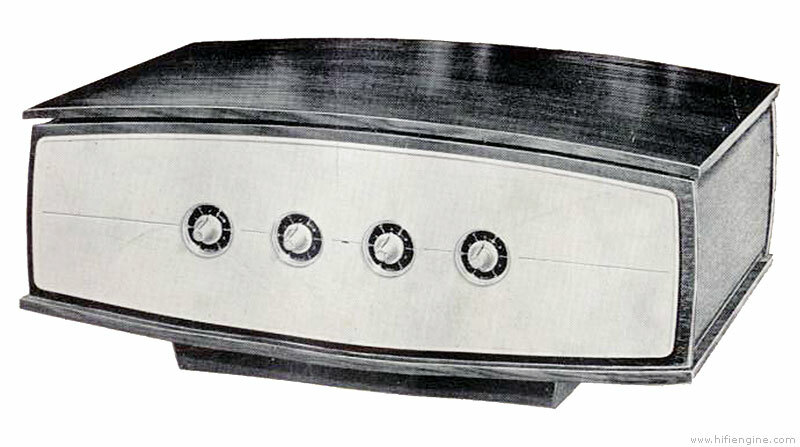 The Pye Stereophonic Projection System has no fewer than six loudspeakers: three for each channel, to cover bass, mid-range and high frequencies. The full frequency range as transmitted to the loudspeakers is then angled out either to the adjacent walls of a corner or two hard side walls to create virtual sound sources. By reflection, therefore, a full stereophonic spread of sound is achieved with startling reality. But the realism of sound spread must be supported by the quality of the material fed to the speakers. A transistor amplifier is used for its lack of background noise, its reliability, its treatment of transients, and for the lack of heat problems. Fitted to the high quality auto changer is a unique, new patent design, pick-up arm and cartridge. This unit is mass balanced with a retractable cartridge. With an optimum playing weight of 2g, record life is prolonged. One of the new features of this pick-up assembly is that if the arm should accidentally be dropped onto or skidded across the record, no harm will result to the music grooves. The system has been carefully designed as a completely integrated instrument, with each component part complimentary to the functions of all components together. The complete cabinet with its special moulding and lid seal acts as an acoustical chamber. This instrument has been designed throughout. acoustically and aesthetically, with the discriminating music lover in mind. Its compactness and quality are presented to give full realism and enjoyment to the recorded scene. PYE 1005 / 1005 owners manual, service manuals and schematics are for reference only and the Vinyl Engine bears no responsibility for errors or other inaccuracies. The PDF files are provided under strict licence. Reproduction without prior permission or for financial gain is strictly prohibited. This website is not affiliated with or sponsored by PYE.